Inlate September, IB Diploma graduate Andrew Beckman received a surprise email from his former college counselor at the French American International School, located in San Francisco, California. It asked if he would be willing to give a speech for the IB Higher Education Symposium, to be held at Stanford University, where he is currently an undergraduate freshman. 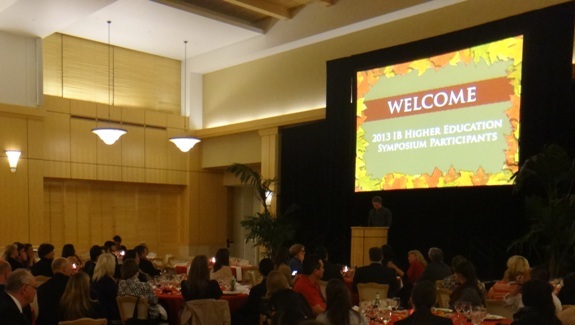 The symposium took place in early October, bringing together nearly 100 admissions professionals. 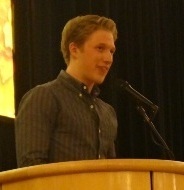 Andrew spoke to the crowd, providing a real-life look at how an IB education helps get students into top universities. This process of reflection was informative to me as it helped me to better understand myself. It caused me to take a step back and think deeply about the ways in which the IB program contributed to the person that I am today and how it factored into my acceptance to Stanford. Much of what I learned as an IB student has carried over to my studies at Stanford and has given me an advantage…the kind of critical thinking the IB instills and the skills it helps develop (e.g. the skill of writing) are very much in line with—perhaps even above—what is expected of me so far in college. These core skills, like writing and critical thinking, are only part of the story. Hinting at the broader objectives of the IB learner profile, Andrew pointed at how some of his courses at Stanford are aiming at bringing students towards the same understanding of their learning that is established throughout the IB. If you are an IB graduate reading this, you will recognize the similarities between this material and the “ways of knowing” addressed in the Theory of Knowledge (TOK). How do we know what we know? And how do we become aware of ourselves as thinkers and more acquainted with the complexity of knowledge? In his speech Andrew admitted this was one of his favorite courses. [TOK] is something unique to the IB and the discussions and assignments I had in that class were extremely formative, providing me with the freedom and knowledge to construct my own philosophical ideas and moral framework. In conclusion, Andrew offered some advice to admissions officers. He asked them to develop a “deep understanding of the different parts of the program and how exactly it all worked.” He believes that the different core requirements, like Theory of Knowledge, the Extended Essay, and Creativity, action, service, prepared him well for University. Andrew is an exceptional and talented student and we are thankful that he was willing to share his experience with the IB community! To learn more about IB recognition policy and higher education events please visit www.ibo.org/recognition.